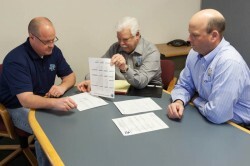 During the proposal process, the Mold Craft team assembles a specification list of details that meet your expectations. Our proposal details these specifications so that you know exactly what is being proposed and when we receive your purchase order, Mold Craft knows exactly what to build. Once the purchase order is provided, the detailed specification sheet is completed. Our design team will listen, or collaborate with you on the design. Once complete, we have a design review either in person or over WebEx where we can show detailed injection mold drawings and models. With design approval, Mold Craft holds a “launch” review to kick off the project. This session insures we have what we need to get prints on the floor and start the injection mold build portion of the project. Mold Craft produces weekly job status reports showing exactly where we are on the various phases of the project. The reports are generated from our ERP systems and show percentage of completion, what stages are complete, what the next operation is along with expected and projected ship date. Yes, weekly.